1. What brought you to the Topps company back in the day and how quickly did you start working within the NPD (New Product Development) department? What were some of the first Topps projects that you worked on for them? To backtrack a little: I enrolled at the School of Visual Arts in NYC in 1978. Part of what brought me there was the cartooning faculty, specifically Harvey Kurtzman, one of the masters of the medium and a personal hero (and via Mad, the main influence on the kind of satiric products that Topps was known for.) Art Spiegelman; an underground cartoonist who also worked for Topps for many years, was teaching comics history there at the time and I got to know him through that. When Art launched Raw magazine in 1980 I was one of three students (along with Drew Friedman and Kaz) invited to contribute. I remained involved, performing editorial and production duties. In the early 1980s Topps was ostensibly looking to bring some "young blood" into their New Products Development department (the dank cluster of cubicles from whence all Topps non-sports projects sprung.) My first assignment arrived in the form of a frantic phone call from Art one Friday afternoon during the summer of 1982, shortly after graduation. NPD desperately needed copy for a complete set of 88 of Jaws 3-D bubble gum card backs first thing Monday morning. Evidently Universal wasn't coming through with a script on time and although they had photos, nobody had a clue what the narrative was supposed to be. So Topps wanted something, anything, else as backup. As directed, I went to the local public library, researched shark and sting-ray and Portuguese man-o-war jellyfish data, concocted a Ripley-like format entitled "Fun Facts About Fish" and delivered all 88, first thing Monday morning. I was immediately told that the script had just shown up and the work was no longer needed. Not too long afterward I found myself invited back one or two days per week and put to work on whatever (NPD creative director) Len Brown needed help with at the moment. Early projects included one of Topps' endless, futile, stupid attempts at "modernizing" Bazooka Joe, transforming generic Spanish import candy packaging into Bazooka Bubble Gum Pops, grinding out "hip" concepts for pinback buttons based on popular song titles ("You can't copyright a song title! "), and brainstorming ideas for cheap plastic candy novelty containers. One of my first; Pow! Powder (a powder candy-filled anarchist bomb with a fuse) was OKed and put into production. So, I guess I was doing OK too and stuck around. 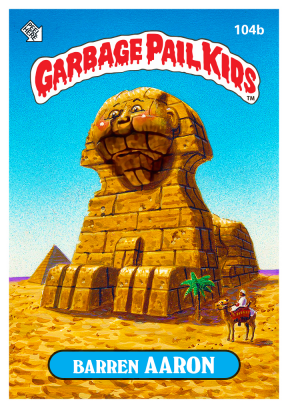 The next thing I knew I was working on a revival of Wacky Packages (a childhood favorite) and eventually through that, GPK. 2. What's the juxtaposition like as an artist, working in a corporate-type environment with rules and regulations and also wanting your own personal creative juices to flow? Were the Topps assignments and the GPK releases rewarding for you? It was a double-edged sword, but I really did put a lot of personal creative energy into Topps projects, especially once GPK was underway. 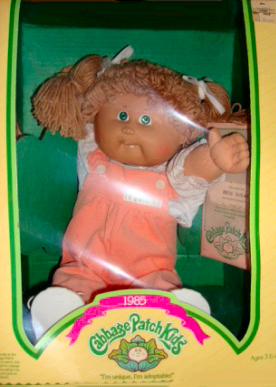 I'm sure I was the first GPK fan. I was actively engaged and protective of it from the start. I was young (and naïve?) and found it stimulating work. Older (and possibly wiser) folks may have held back more and stuck to the playbook. But I didn't know the playbook. I was always one for pushing the envelope a little I guess, and lucky to be in situation that sometimes allowed for it. Topps, in those days was nominally "corporate", but it really wasn't Corporate. It was a unique, idiosyncratic parallel universe unto itself; a truly dysfunctional family business. There were plenty of built-in frustrations there to be sure, but also plenty of opportunity to balance them out, because I was never really a Topps nine-to-four-thirty-er. I kept busy. When I started there I was also still working on RAW, co-editing it's sister 'zine Bad News, illustrating and creating strips for NYC alt-weeklies like The East Village Eye and The Village Voice. By 1988, I was teaching at SVA myself and had a weekly slot in the NY Press, but still putting in my 3 days a week at Topps. Topps was cheap, but it basically covered my cheap, 1980s Brooklyn rent. 3. With your cartoonist background, how much of this were you able to transition over to your Topps jobs? Well, I was just starting out but it was a very easy fit. 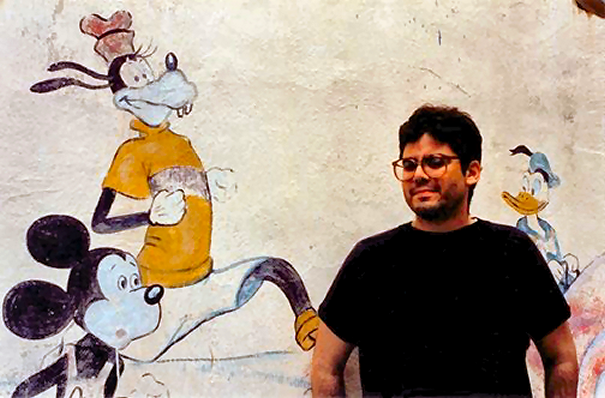 I had the right resume I guess: SVA cartooning grad, comics history nut and former teenage fortune cookie author. NPD was basically a playpen for pop-culture geeks and hungry, irreverent cartoonists. Besides that, I was the oldest of 6 children, still living at home and had a direct pipeline into contemporary kid culture - which was a valuable commodity at Topps. If not actively fed or cultivated, that connection to "what kids like" is a perishable asset. Once you lose it, you might as well be 87 years old and telling kids mother-in-law jokes in Yiddish. was there any particular set that sticks out the most for you or felt the most rewarding? As I recall, Art really didn't get too involved in the card backs, per se. He was usually there just one day a week and other issues demanded more attention. I do remember having fun with those giant GPK 5"x7" stickers, both fronts and backs. And the poster series too. There was more real estate to cover in those formats, so they were a little more ambitious, I guess. Both projects were squeezed in between regular GPK series and set on particularly hairy, almost absurd schedules. I remember having to put in a lot of extra time and effort to see them completely through the sausage grinder. was there anything left unmolested? What was your take on the whole case? It was a bit unnerving. There was a lot of emergency closed-door meetings and palpable anxiety. Most of my GPK drawings vanished from the office overnight, never to be seen again. (A lot of them eventually reappeared in the form of 4th generation Xeroxes with court exhibit numbers stamped allover them.) They didn't want me testifying. They didn't want Art testifying. 6. What was it like working with the many artists involved in creating GPK? Correspondence and communications is so different now-a-days; I would imagine receiving Pound's paintings with paint strokes would be a lot different than receiving a scanned electronic image these days. 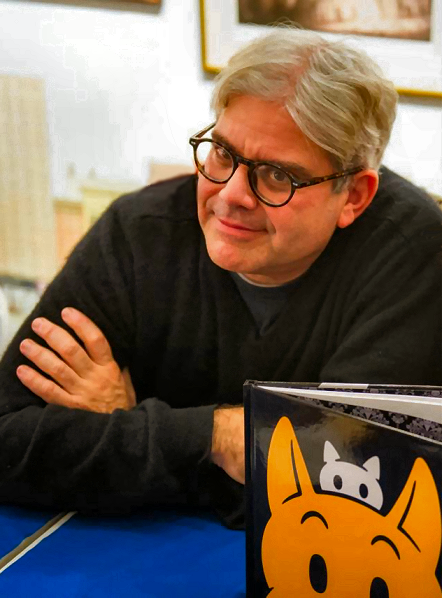 Can you explain the teacher/student relationship you had with Spiegelman and were you comfortable directing the GPK artists? I have to say, the original sets are untouchable when it comes to the level of quality (even printed on lesser-grade card). There was always a lot of creative back and forth, it was a big part of the job. Phone meetings, faxes, Fed-Exed tracing paper overlays with notes. Art and I were usually on the same page. John's pencils or paintings would come in on a Monday and I'd make notes all over them. Then on Tuesday, Art would make notes on my notes and we'd usually call John in the afternoon and hash it all out. Tom Bunk and James Warhola were local, so they'd take the subway. We'd all do lunch in the fabled Topps cafeteria and then go through the same routine in person. At times (when there was time) we'd go through 2, 3, even 4 rounds of revisions on a single image to get it just right. The input usually focused on emphasizing clarity and amplifying (or extending) the gag. The goal was always to balance impact with visual clarity. May sound obvious, but it really isn't always so simple. 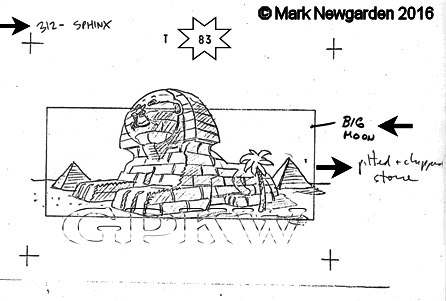 The initial staging or composition of a GPK gag was crucial as to whether it lived or died. Then the execution needed to be solid and plausible and never distract, or get in the way of the concept. John set a very high bar from the start. Tom [Bunk] brought a wacky energy to the mix. James [Warhola] added an air of foreboding mood and mystery. Seeing what these guys would come back with was always the highlight of my week. It was fun and collaborative, and I think our fresh eyes and brain cells helped make better GPKs. 7. 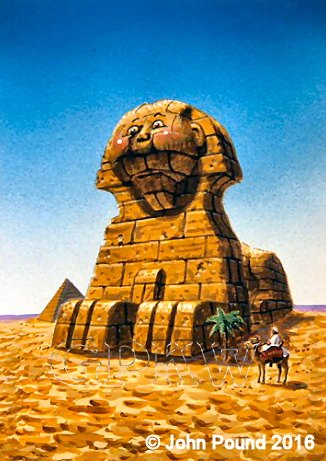 I've always been enamored by GPK and have highly admired the GPK artists behind the card artwork; the main goal for the site was to give credit where credit was due; it's been a lot of rewarding years digging up information. Was there anything you were able to take away from the GPK project after it wrapped? Any keepsake of sorts that you had to have? I normally keep comprehensive "process" files for the various projects I work on. 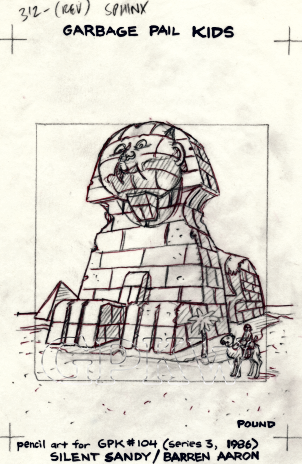 (In fact, I have often used GPKs to illustrate the concept/ thumbnail/ sketch/ finish stages of illustration in the classroom.) 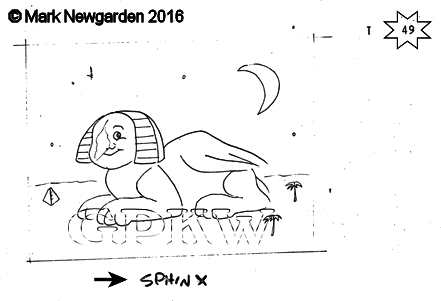 One artifact I tripped across again recently was a spiral notebook that I kept in 1984, while working on Wacky Packages, with my lists of products with parody potential and the initial gag concepts for each of them. Most of the major food conglomerates had sent Topps "cease and desist" letters over the years and their brands were considered off limits for Wacky Packages, so part of my job was to suss out new products from manufacturers that were (hopefully) less litigious. I have fond memories of walking the isles of Toys-R-Us on Bay Parkway with Len Brown, scouting prospects and jotting them down. This page is where "Garbage Pail Kids" first saw the light of day. 8. What was Topps' reasoning behind adding new artists like Tom Bunk, Mae Jeon and David Burke during the 3rd Series? Was this foreshadowing on their behalf knowing that John Pound wouldn't be able to keep up with the release schedule? Those sets started to be printed every 3-4 months or so like clockwork. During work on series 2, we got word from the Topps suits that GPK was REALLY taking off. So the garbage was hitting the fan and NPD basically had to gear up for mass production. The powers that be wanted more GPKs faster, with less reliance on any individual. 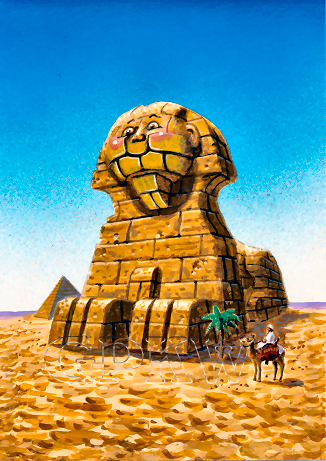 Tom Bunk was onboard with GPK right from the start, illustrating the backs. Meanwhile he had honed his rendering skills on a similar Topps series entitled Gross Bear Buttons, which had developed alongside GPK, but on a slower track. Tom switched over to painting GPKs just as we were ramping up for series 3. Mae Jeon worked in Ben Solomon's art department (where they airbrushed baseball player's warts.) When the push was on, there was some pressure to try her out on GPK paintings. She wasn't a cartoonist, so she was given a couple of John Pound's pencil sketches to work with. 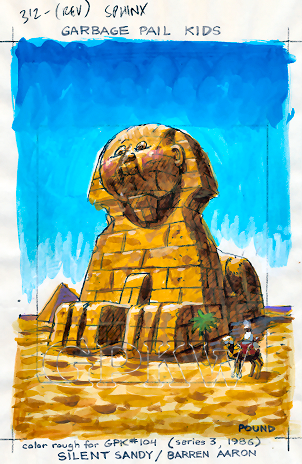 David Burke, a fledgling illustrator, was also assigned a handful of concepts around this time. We tested out a number of others as well, but Pound, Bunk and Warhola ultimately became our GPK dream team. 9. The early GPK sets seem more hands-on for the art directors, in general. Creating new product and recycling old material for the card backs. Were the later releases just as hectic, or was there a team in place where the group was working like a well-oiled machine? How thrilled were you of these new changes in features? 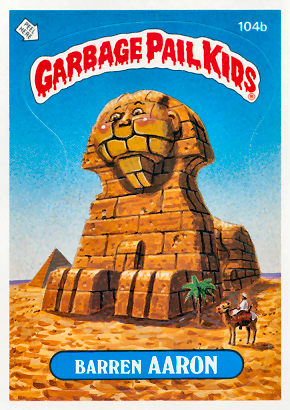 By a certain point, maybe series 3 or so, GPK had pretty much become the only thing I worked on at Topps. Once the formula and the team were in place, the pace relaxed a little into a more evenly paced workflow. It could still get hectic as deadlines loomed, but we knew where we were going. I think the quality and cleverness of the images improved in many ways, but on the whole they also lost some of that initial iconic strength in the process, especially after the lawsuit and redesign. They were less appealing and there was also a little bit of a loss of visual continuity for the seasoned collectors. 10. Collectors were lucky the settlement allowed the 8th and 9th Series GPK to be released, since they were 'completed'; but we weren't so lucky with the 16th Series release. Do you feel GPK had run its course at that point? That is quite a few years working on a project and I'm sure the brain wants to exercise its creative side (in other areas). Were you looking forward to different projects, or personal work? After GPK, there was some room for new directions and a lot of experimentation in NPD and that was exciting. Some ambitious products, like Toxic High, Pee-Wee's Playhouse and Gruesome Greetings made it out into the world more or less intact, but a lot of truly excellent projects (Ugly Americans, Loco-Motion, Wanted Posters and at least new 2 new Wacky Packages sets) were green-lit, completely executed, and, for reasons I still do not completely understand, put on the shelf and never released. Topps, as a corporate entity, was in flux. They were leaving the gritty Brooklyn waterfront for Wall Street, and to me it a signal that the time was right to move on. 11. Any thoughts on the lasting impact GPK has had on our nostalgic psyche and is it strange for you to be re-living the fad after so many years? I think that for those of us that were part of it, GPK has never quite gone away entirely. Our kids are still out there bouncing around on the far edges of the culture somewhere, poised to vomit down on us all over again, whenever we least suspect it. 'ARROW' (3RD) = SPIEGELMAN'S COMMENTS: "PITTED + CHIPPED STONE"
that would've amused me sitting in an office environment. It was always a sign of success when we saw our product's wrappers outside Topps littering the sidewalks and gutters of New York. This happened with GPK during our first local tests, but it was only a preview of what was to come. On Tuesdays, after our day at Topps was done, Art used to drive back into Manhattan and I'd often go along for the ride or to hang out afterwards at his place in Soho. He'd normally drive over the Brooklyn Bridge and cut through Chinatown, where one day we both did a double take when we saw some elderly guy, literally standing on a street corner selling uncut GPK series 2 sheets (it had JUST been released.) We stopped and checked them out- they were obvious counterfeits with fat Moiré patterns (shot and printed right off of original Topps press sheets.) How an original uncut sheet made its way into the hands of the nefarious Chinatown counterfeiters so quickly is still an unsolved mystery... but it shows how fast these things took off. Not long after this I was in my local supermarket where I happened across a vending machine dispensing crude, ersatz GPK stickers. And the very next day I was accosted by a hustler on the F train peddling bogus GPK watches. 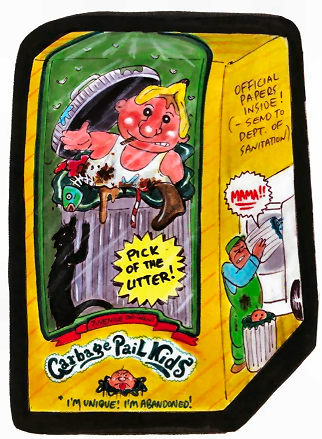 I soon became aware of GPK stickers almost everywhere I went; plastered on streetlights, in elevators, on the subways and in public restrooms. I felt like Frankenstein, stalked and taunted by own miserable children!